According to Kendall Lockhart (VP of creative development at Disney Interactive) people flock to tie-in games to interact with characters and worlds they have already fallen in love with. But who exactly is this rock hard part-platformer part-driving game aimed at? There's a scene that every parent sees when they take a child to a Saturday Morning screening of the latest animated blockbuster. However it isn't a scene they will see on the screen it's the chaos in the foyer before the film has even started. Crowds of over exited children queue for popcorn and beside them are grinning parents, trying to disguise how eager they are to see the film. Hollywood big wigs didn't get where they are without being aware that the ultimate film is one that audiences of every age can fall in love with. If a grown up thinks there is something in it for them, they'll buy into the inevitable wave of tie-in merchandise. Maybe they will be the ones suggesting a return trip when the sequel is released. But it's not just parents who now love "children's" animated films, it's adults in general. According to a study carried out by The Guardian newspaper, in the opening weekend for the US release of 'Finding Dory' the highest number of sold out screenings were for performances after a child's 7pm bedtime. Knowing the shift in audience, "children's" animated films have become filled with the kind of jokes that adults know are aimed at them. This is certainly the case with the 'Toy Story' movies. Each film is awash with parodies of other films and wink-wink nudge-nudge innuendo. 'Toy Story 2' offers a scene where Rex the dinosaur chases a toy car in a way that echoes 'Jurassic Park'. Meanwhile the first 'Toy Story' film followed Buzz Lightyear's existential crisis when he discovers he is "just" a toy. It is a profoundly adult story line. For 'Toy Story' director John Lasseter the inclusion of aspects that exclusively appeal to an adult is easily explained. "We make the kind of movies we [as adults] like to watch. I love to laugh. I love to be amazed by how beautiful it is. But I also love to be moved to tears. There's lots of heart in our films." While children's animated films may now court an adult audience, the games based on them have increasingly become more child friendly. Modern Licensed games are generally poorly received by reviewers; they tend to be criticised for being too simple or too easy. Even big child friendly franchises like (the no longer supported) 'Disney Infinity' default to easy modes to allow even the less adapt child to progress. For modern games based on animated "children's" films there's challenge if you wish to find it, but typically that requires manually raising the difficulty or setting your own goals. Rewind twenty years and things were slightly different. While there were some spectacularly easy tie-in games, there were just as many licensed games that were unashamedly difficult. There are games that can only really be enjoyed by a seasoned older player. Given the success of the film it's not shocking that 'Toy Story' games appeared. What was surprising was just how incredible the Mega Drive game is and how challenging the game play was. "Being that this is a non-violent game targeted for kids, I don't understand why Disney chose to make 'Toy Story' so difficult. It's hard" noted Game Fan magazine. "I thought for sure that this was going to strictly be an easy children's game" agreed Electronic Gaming Monthly. "But [...] I've realized that players of all ages can join in!" The game closely follows the plot of the film, largely at the insistence of Marc Teren, Vice President of entertainment for publisher Disney Interactive. 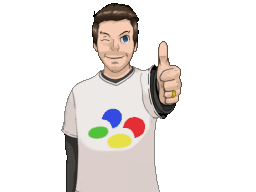 He believed that developers should "create games that are a true and fair representation of the original property". Each level of 'Toy Story" starts with stills from the film surrounded by text describing the story as it unfolds. Every stage has an objective that's tied to this, albeit sometimes tenuously. For example in an early stage, the player must return the toys to hiding places before they are seen. Impressively designer Jon Burton and his team managed to remain faithful to the film's plot despite the fact that they were working on the game while the movie was still being finished. It was common at the time for licensed games to hit the shelves to tie in with a film's video release. 'Toy story' on the Mega Drive however was available when the film was showing in cinemas. "The first 'Toy Story' game was the first game in history to launch day-in-date with a movie" boasts Burton proudly. 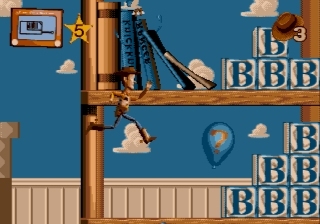 For the most part the player adopts the role of Woody the Cowboy in side scrolling levels. While he can whip his pull string the game is notable for lacking aggression. Level foes are momentarily restrained rather than killed. Instead rather than killing everything the challenge on most stages is to complete a specific objective within a tight time limit. Stages while small are complicated with multiple routes and raised secretions that can only be accessed by using bouncy balls to propel Woody higher. However the jumping is exceptionally loose and imprecise which takes a while to adjust to. Also it's not always clear what is a platform that can be stood on and what is simply part of the very attractive backgrounds. Similarly while it's nice to allow Woody to use his pull string to latch and swing on the scenery it's never that clear when this is and isn't possible. I found myself stuck simply because I hadn't realised completion of the stage required swinging. On a different occasion however I died multiple times before realising that this wasn't an occasion when swinging was permitted. 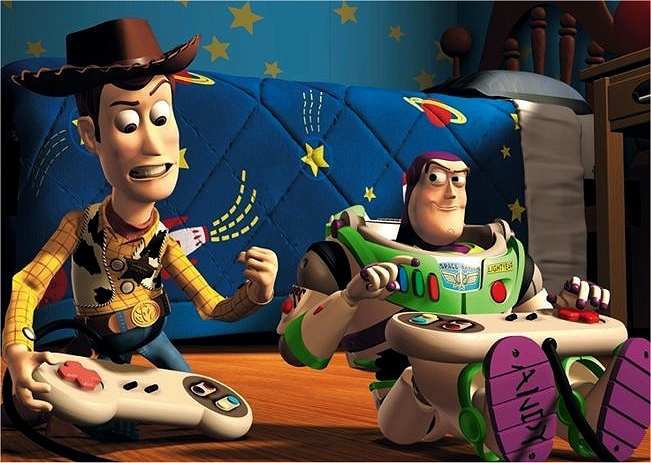 'Toy Story' came out at a time when the majority of tie-in games were platformers. After playing through the first few stages I believed I had the measure of the game: I was convinced subsequent levels would simply be variations on what I'd already played albeit with different backgrounds and obstacles. Imagine my surprise when later stages introduced entirely new game mechanics. 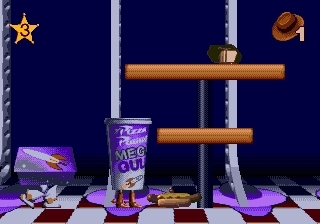 Like the film it's based on, the 'Toy Story' Mega Drive game isn't afraid to venture into other recognisable genres and even parody other games. "Rarely do you come across a game that features such a wide variety of playing styles" noted CVG magazine. "Mega Drive owners will be especially pleased with the eleventh level - who'd have thought that such a seemingly innocuous scenario would play host to a spin on 'Doom'". “I remember an absolute defining moment" recalls designer Jon Burton. "We had met John Lasseter and I had written this 'Doom' engine, but on the Mega Drive, which no one had done at the time. I said, ‘this is the viewpoint we should do,’ and he was saying, ‘Well I think it should be more this,’ and I suddenly had one of those ‘we’re not worthy’ moments. I’m debating 3D viewpoints with John Lasseter! It was great to meet and chat with these people that I had idolised when I was growing up.” In the end they agreed that one "exceptional level" should be viewed from the character's perspective. 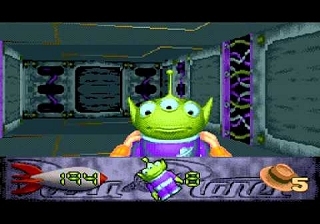 The level in question sees Woody finding lost aliens trapped inside the inner working of their claw-grab machine. It's even more impressive when compared to the Super Nintendo's 'Doom' or the First-Person viewed sections of 'Jurassic Park'. Both of these lack floor detail and run in tiny windowed displays. "Disney have succeeded in achieving the impossible by creating a credible 'Doom' style game for the Mega Drive, a machine many detractors dismissed as being simply not capable of the feat." Computer and Video Games magazine claimed, but their glowing praise was not a lone voice. 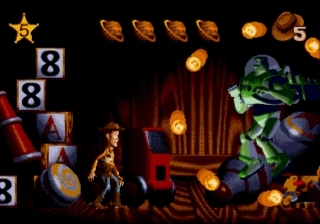 "Whoever thought that ['Toy Story'] would set the scenario for the Mega Drive's only spin on ‘Doom’? [It's] an incredible achievement" agreed Mean Machines magazine. However, calling this part of the game a 'Doom' clone is giving it too much credit. There’s no shooting in this First Person Shooter section, all you need to do is explore a handful of interconnected rooms till all the aliens have been found and carried to the start of the stage. While technically impressive, the novelty wears off quickly and it becomes tiresome getting lost in identical looking rooms performing the same task repeatedly. Far more enjoyable are the driving levels, or at least two of the three driving levels are. 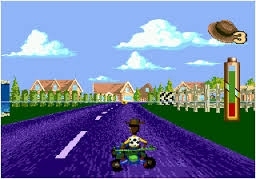 One level, "Day-Toy-na", is an 'OutRun' style level where you see a chase view of Woody riding on the back of a radio controlled car. This Mega Drive exclusive level plays like a number of sprite based driving games and would be enjoyable if there were other vehicles on the road. Without road base obstructions, all you need do is negotiate corners and collect batteries, which is exceptionally boring. Far better are the top down viewed driving sections that play like 'Micro Machines' games. These parts of the game look great and easily eclipse the visuals of the game that has clearly inspired them. But lovely visuals are hardly surprising given the stages are part of a game that Mean Machines magazine called "the most impressive Mega Drive title ever released". "It stretches the Mega Drive as far as it can go" pointed out critic Marcus Hearn. While games like 'Donkey Kong Country' had boasted pre-rendered 3D sprites on the Snes, they hadn't been seen on the 16 Bit Sega machine. At the time Marc Teren was Vice President of Disney Interactive. In press releases he claims that "the 'Toy Story' video game offers an exciting opportunity for Disney to shatter 16 bit video game limitations and literally broaden the entire 16 bit market. The result is a game you have to play to believe". Critics certainly bought into Teren's wild claims. "'Toy Story' raises the stakes on Genesis visuals forever" Electric Playground said at the time of the game's release. Reviews for the game even claimed the visuals were comparable to 'Clockwork Knight' on Sega's Saturn; the console successor to the Mega Drive. It was an astute observation for critics to make as designer Jon Burton has later admitted to Retro Gamer magazine that concepts for this Saturn launch game were borrowed. "Yes, it was 'Clockwork Knight', the game on the Saturn that we took the concept of to make 'Toy Story'". Regardless of the inspiration, 'Toy Story' is a great example of just how much can be achieved by talented developers at the end of a consoles life. "Anyone writing off 16bit hardware should take a long sobering look at this" noted CVG. "The size of the characters, the number of characters on the screen at the same time, it's not been done to date," claimed Kendall Lockhart, part of the creative development team at Disney Interactive. "So on a technology side, we've delivered breakthrough programming, breakthrough engineering that has not been done on other games." According to Lockhart "the creation of ‘Toy Story', was all done by a small outfit in England". This was Traveler's Tales, now best known for their Lego based games. However Computer and Video Games magazine were keen to point out that their "unrivalled" graphics did have some undesirable effects on the game play. "Some of the principle character sprites are unusually large and feel a bit cumbersome as a result". In fairness they did claim this was simply nitpicking though as "none of these grumbles detract from the overall impression of near perfection". According to Lockhart, perfection was what the publisher Disney Interactive demanded from developer Traveler's Tales. "We have no choice but to do the best quality product, or the company wouldn't let us release it even if we wanted to release it. The standard, the bar is extremely high. Look at our animated films. Look at our properties. Look at the amount of money and time that are put into those things. We have to do the same amount." This is perhaps why audio treatment in 'Toy Story' is so elaborate. The music composed by Patrick J Collins benefited from the inclusion of a MOD player within the game's code. This allowed the Mega Drive to play back higher quality, less compressed Amiga music files. This is the only game on the Mega Drive to include the player and it explains the crisp sound of the menu and title music specifically. In the film Tom Hanks plays Woody the Cowboy, in the game the same character has been voiced by his brother Jim. This is an arrangement that would continue up until the inclusion of Woody in 'Disney Infinity' and it meant that specific relevant audio could be recorded for the game while still sounding like the character on the silver screen. It's a slight of hand that Tom Hanks readily admits to; "There are so many computer games and video things and Jim just works on those all year long.” The Mega Drive game has far more vocal samples than the Snes version of the game, including a large range of cries from Woody and even the inclusion Buzz's iconic "to infinity and beyond" quote - noticeably absent in the Snes game. Also sorely missing from the Nintendo port is the film's "You've got a Friend in Me" theme tune. On the Mega Drive Version this plays during the story intermissions, which incidentally feature more stills from the film than the Snes game does. It's touches like this that make the Sega version of the game superior to the that on the Nintendo machine, despite the latter having slightly cleaner sprites with more colours on screen during the levels. In fact it was the Mega Drive version that Disney used for footage when promoting the game on the VHS release of the 'Toy Story' film. According to publisher Disney Interactive, the Super Nintendo and Mega Drive versions were both "tremendous successes". However given the time of release players didn't always have the flexibility to choose between the systems. A SNES chip shortage prevented Disney Interactive from producing as many copies of the Super NES version as they believed they could have sold. Game Informer called 'Toy Story' on the Mega Drive "a humorous and fun adventure that will certainly entertain everyone in the whole family". It's a review that would certainly have made Marc Teren happy. "People that have never been drawn to the computer or games as a form of entertainment experience are going to find the products that are being developed now very engaging," said the Disney Vice President. "With ['Toy Story' the game] I think we are going to find a much broader market than the traditional video game enthusiast." During the mid nineties it's was clearly not just animated "children's" films that were hoping to attract an audience that included adults; game designers also had a catch-all approach. However If 'Toy Story' is a barometer of all licensed games from the mid nineties, children may not have got much enjoyment from the games-based-on-films that were apparently aimed at them. It's a shame that the difficulty of 'Toy Story' may have put some off, as the game is superb. Typically when a game embraces too many genres, individual parts are weak but that's not the case here. I enjoyed the overhead driving sections as much as I did the platforming stages; which on their own showed great variety and ingenuity. It's not often you play as a character disguised using a soft drink cup, while escorting another character hiding in a burger box. I also don't recall ever playing a game where you ride on a skateboard to escape a giant dog, or attempt to restrain a deluded space toy using a car tire. Like the parodies in the 'Toy Story' film it's likely that the references to other games will be lost on any child able to progress in the game but that doesn't really matter. Not knowing the origin of the parody doesn't hinder enjoyment, nor is knowledge of the source film required. The true test of a tie-in game is always how well it stands when the license is removed. For Mean Machines magazine the game could have been labelled anything and would still have been a success. 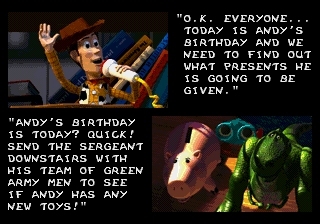 "'Toy story' is a sophisticated and worthy compliment to a ground breaking film [which] would stand alone without its lucrative license"
I gave my wife a list of games that I wanted for my birthday. Thankfully she totally ignored it and instead got me 'Toy Story' knowing how much I like the film. She was surprised it wasn't on my shelf already considering I have many other Disney licensed games and it was a shameful omission I'm very pleased to have now addressed.